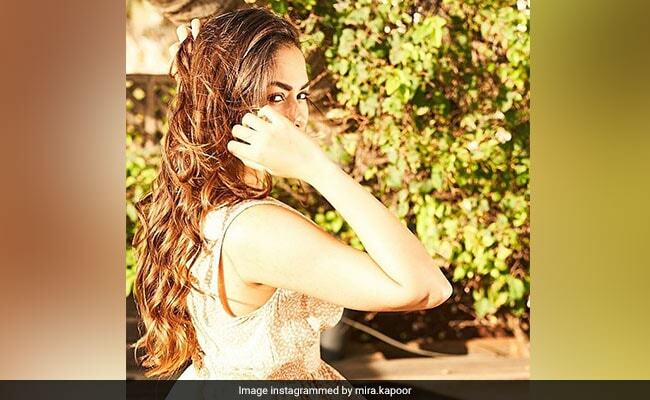 Mira Rajput just helped sunshine stream into every nook and corner of Instagram with her "sun-kissed" album of photos. Mira Rajput's pictures appear to be from a recent photoshoot for a promotional event but that's not what this is about. Mira's latest entry to the sun-kissed album is a mid-shot of herself, in which the wind appears to have ruffled her hair with only her eyes visible to the camera. Her Instagram is indeed flattered by the "awesome" shot and comments such as "I'm at a loss for words", "pretty" and "beautiful smile, always looking gorgeous" rained down on her Instagram. Mira Rajput often always trends for her Instagram posts, mostly for the interesting captions she posts with. Like only recently, she shared a photo of baby Misha and Shahid Kapoor from a grocery store in which Misha can be seen sitting in the shopping cart. "Fresh produce! Which aisle stocks these sweet treats?" she wrote. Then for another photo featuring Shahid, she wrote: "Find someone you can hug, kiss and kick. And then don't ever let them go." From when she was pregnant with Zain, Mira Rajput wrote: "Happiness... beside me and inside me." Mira Rajput has accompanied Shahid Kapoor to Koffee With Karan and many more award shows subsequently. Mira and Shahid also featured in their first magazine cover together last year for Hello! 's November edition. The couple are parents to two children - two-year-old Misha and Zain, who was born in September last year.